These are Highly finished detailed 1:50th Scale Diecast Model Trucks From Holland. Available to add straight to your basket! Stock changes all the time so please check back for up to date models. 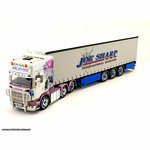 WSI Models Scania Ristimaa "Wasp"
WSI Volvo Ristimaa "Cider Shark"